Description: "These irresistible toys from an expert toymaker promise many hours of fun for adults and children alike. Thirty nursery rhymes are brought to colourful life as soft toys, glove or string puppets, dolls, a pull-along toy, a mobile, and even a musical drum – imaginative toys which are joy to make and delightful to play with. All the old favourites are here: Mary had a Little Lamb, Humpty Dumpty, Jack and Jill, Little Bo Peep (plus a few lesser known rhymes). Often the toys have accessories like Little Miss Muffet's spider and tuffet, Bo Peep's lambs and Simple Simon's fishing rod. 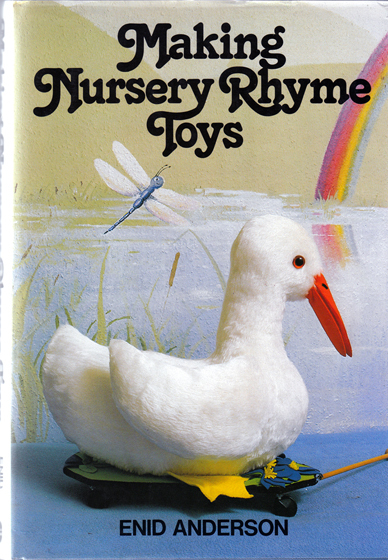 There are  full-colour photographs of each toy, with comprehensive patterns and instructions for all techniques – making this a thorough course in the craft of toymaking. In many cases the patterns provide scope for further development, so that experienced toymakers can go on to create their own completely original toys." Blue cloth boards with gilded text. The jacket is lightly scuffed along its upper edges, but is otherwise excellent. The book itself is in superb condition: the spine and corners are completely straight, whilst the pages are crisp, bright, and free from foxing and tanning – except for the slightest hint of the latter in the gutter. Measures 25 cm × 17 cm (10″ × 6.8″). 4to. 176 pp.